This post teaches you how to install and properly setup Simba to work with Old School Runescape. Simba is the open source program that we use to write, compile, and run all of the code used in the Runescape scripts found on the forum. This means that if you plan to write your own script or one that has been posted on the site, you will need to make sure Simba is installed correctly as well as the proper include (more on this later) to be able to have the script compile and run. The language used in Simba is called Lape. Now that you have a bit of an understanding of Simba, let's get started. Before we jump into it, you should know about the different types of includes that we have on the forums. In the case you do not already know, an include or library is a collection of code that is already written in such a way to allow the programmer to accomplish a specific task with ease by giving the programmer a collection of methods/functions/procedures to use. Below you will find the different types of includes that are available for OldS chool Runescape. Each is linked to their development threads or Github pages, as well as some tutorials to help you make up your mind on which one you feel is best for you. For this tutorial, I will show you how to install the Old School Runesape SRL-OSR library. [SRL]How To Write Your First Script: Collecting and Banking Cabbages! Get the latest 32-Bit version of Java from Oracle's Java Download Page. After downloading the installer, run it and install to your computer. It is recommended that you install to the default location since there is a lower possibility that Simba cannot find the Java installation folder. NOTE: You may be a little confused as to why we are needing to install Java since Runescape does not completely depend on it anymore. The primary reason we do this is that we use a program known as S.M.A.R.T. which is a virtual environment that runs the Java version of Runescape and allows you to have multiple bots running concurrently. We do this in the case that you want to be able to use S.M.A.R.T. but it is not always necessary. You can read here for more information about how to run multiple instances without S.M.A.R.T. Download and install Simba from here. Download this release of Simba and place it in the installation folder (You will be using this version to run all of your Old School scripts from now on). Download the SRL-OSR include and extract it to "C:/Simba/Includes/". Download the RSWalker include and extract it to "C:/Simba/Includes/". Note: There should now be two folders named "C:/Simba/Includes/SRL" and "C:/Simba/Includes/RSWalker". Compiled successfully in XXXX ms.
Simba 1.3 has been updated to include more features and make writing and editing scripts a bit easier. This update currently only works with the OSR Include. If you are interested in trying it out, you can follow the steps to setting it up below. Download Simba 1.3 from here and place it in the directory "C:\Simba 1.3". Open up Simba and open the Package Manager by clicking the icon. Press Install and overwrite the installation directory. If you wish to read more about the features of Simba 1.3 and its updates, click here to view the original thread. Congratulations! We are almost done! All we have to do now is worry about making sure our in-game interfaces are setup correctly. Each version of Runescape has to be setup a little differently, so be sure to pay close attention. 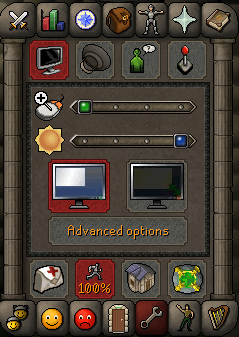 Open up the in-game settings after you have logged in on your account and set brightness to max and set zoom to max. Set window size to 'Fixed'. 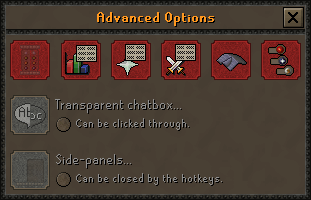 Then click on the Advanced Options button and enable Roof-removal. Not needed but recommended you also enable Shift Click Drop under the Controls section. Now you are ready to get running with Old School Runescape scripts! Last edited by StickToTheScript; 04-12-2019 at 06:09 PM. Reason: Updated. CLICK HERE TO SIGN MY WORLD! This post teaches you how to install and properly setup Simba to work with Runescape 3. Before we jump into it, you should know about the different types of includes that we have on the forums. In the case you do not already know, an include or library is a collection of code that is already written in such a way to allow the programmer to accomplish a specific task with ease by giving the programmer a collection of methods/functions/procedures to use. Below you will find the different types of includes that are available Runescape 3. Each is linked to their development threads or Github pages, as well as some tutorials to help you make up your mind on which one you feel is best for you. For this tutorial, I will show you how to install the Runescape 3 SRL-6 library. All-In-One RS3 and SRL6 Scripting Tutorial! How To Write Your First Script: Collecting and Banking Cabbages! Open Simba.exe and select Script->Interpreter->Lape. Close the window and click on Extentions->Check for Updates. Restart Simba when the updates have finished. NOTE: If you happen to run into any problems, you can download SRL-6 from here, download SPS from here and place their respective folders in "C:\Simba\Includes". You can download Plugins from here and place the folder in "C:\Simba". Restart Simba one last time. ------ Attempting to spawn a new client..
Open up the in-game settings after you have logged in on your account and set Load Layout to Old School. Then click on the Settings button and enter the Interface tab. Click on Graphics and set detail to Low. 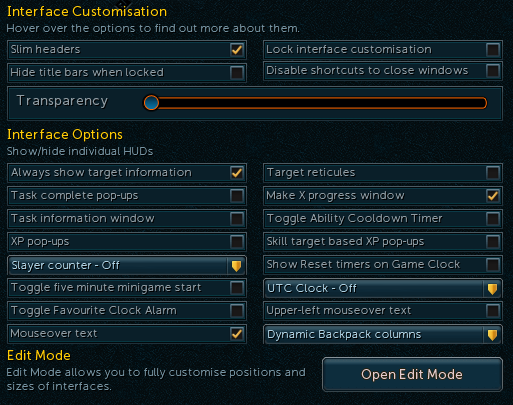 Now you are ready to get running with Runescape 3 scripts! Last edited by StickToTheScript; 12-30-2018 at 05:00 AM. This post is about what to do if you have any questions or need help. Join the IRC Webchat . Create a thread in the General Botting Help section. If you need help with Old School Runescape, post here. If you need help with Runescape 3, post here. For any questions about public scripts, please post on the respective thread instead of creating a new one. Visit the Help & Tutorials section if you are ready to try writting your first script! You will find lots of help and tutorials for Runescape 3, Old School Runescape, other programming languages, and more! - This is recommended because it covers the basics of a Simba script, and lots of basic ideas that apply to every include (i.e. Procedures, functions, variables, arrays, etc). - This is recommended because it covers the basics of Simba, Mouse movements, and more. Once you have completed your first script and you would like some feedback, feel free to post them to the First Scripts Section. Otherwise, you can freely post them in the Runescape 3 Public Scripts Section or the Old School Runescape Public Scripts Section. The Simba Documentation has lots of information that can often answer general questions and inform you about how Simba works. If you have not taken a look through it yet, I would highly recommend it. NOTE: Keep in mind that some of the information in the documentation is out of date but that does not mean it is not relevant. Below you will find common frequently asked questions and their solutions. As more are discovered, they will be posted here. What is Simba and is it safe to use? Most of your questions regarding Simba can be answered by visiting the Simba Documentation. You will also find that since it is an open source project, both your computer and your account are safe. There are so many includes. Which one do I choose? If this is your first time ever programming, I'd recommend that you start with SRL-6 for RS3 and either SRL-OSR or AeroLib for Old School. If you are a little more advanced already, feel free to experiment and look through the information given by the others. If you're still stuck on trying to figure it out, feel free to post or PM me and I'll help you out! I am getting errors while attempting to install. What is wrong? If you are ever stuck with getting errors while attempting to install an include, feel free to jump in on our chat services and ask away! There is a large number of people willing to help! Just remember, be specific when asking questions! I followed the tutorial but nothing works. What do I do? It is possible that you happened to skip over a step, place something in the wrong location, or just made some sort of mistake along the way. If this happened, just try to uninstall Simba and delete the installation folder and try all the steps again. If this still did not work, you are more than welcome to post here and we will do our best to help you out! When choosing which version of the Java Development Kit (JDK) to install, make sure you choose the 32-Bit version. The 64-Bit version will not work. I am able to load an instance of SMART but cannot get my player to log in. I am getting an empty/black screen when loading SMART. Open Simba 1.1 [Simba.exe], find the SRL menu, navigate down to "Automatically.." disable "Update" and "Check for update". Now repeat these steps under the plugin menu as well. Once done, you must naviage to the plugin menu once more, and this time under "Settings" select override update if it's not already. Now still under the plugin menu, click "Update" and wait for it to update. The problem should no longer appear, nor reappear. Again, as always, use Simba 1.2Rc to run your script. Let there be no confusion about that. This is most likely because of a problem with your antivirus. The file is completely safe to use, it just gets flagged by certain AV's. You can add the Plugins folder to your AV's ignore list if you wish to continue using it regularily. If anything is missing or needs to be corrected, please let me know and I'll update it as soon as possible. If you have anything to contribute, please let me know and I can include it. NOTE: For those with their own modified versions of the includes, I have not included those since I am trying to keep things simple. Wow, this is awesome! Thanks for putting all of this together. It must have been a lot of work. Download the newest Simba update from here and replace the Simba.exe file in your installation folder. You probably shouldn't replace the official version of Simba. There's no reason not to keep both around (for now). Ha ha! Thanks! I completely agree. I accidentally wrote replace instead of place. All fixed. Last edited by StickToTheScript; 04-22-2018 at 10:00 AM. Very nice tutorial, something the forum desperately needed. Thank you! GitLab projects | Simba for Linux | Find me on IRC or Discord | OSRS scripts | Come play ScapeRune! Great work! Nice to see this on the front page as well! Please only contact me through SRL-Forums and through no other medium as that may not be me. SRL Updater: Local Version - "1" | Remote Version = "1403"
SRL Updater: Update File - "http://wizzup.org/static/srl/srl-6.tar.bz2"
You'll have to manually update the SRL. Last edited by Grendal; 04-29-2018 at 05:33 AM. You just have to use the package manager in the referred Simba version to update. And if you also use the old simba (<= 1.1), and there are update conflicts, then you just disable it's updater. The "SRL Updater", is not part of the Simba version recommend in this tutorial (hereafter referred to as Simba X). So that message is from Simba 1.1, and only happens because of the package manager which is in Simba X isn't compatible with the updater in 1.1. So roughly what happens is that the updater in Simba 1.1 doesn't know what version of SRL-6 you have, so it just updates SRL-6 itself. Refering to the referenced version of Simba as Simba X because it's NOT Simba 1.3 as the name suggest, nor is it Simba 1.2, just simply a fork of Simba that expands on Simba 1.2 with experimental features and changes. Last edited by slacky; 04-29-2018 at 07:37 PM. Hey, thanks very much for the tutorial. I'm having an issue though... Despite uninstalling and starting over a couple times my script doesn't return from the srl.Setup procedure. The SMART window opens but nothing called after the setup procedure is executed. Any ideas? Does anything show up in the debug box in Simba when you run it? Also, since SMART does open, it does mean that Simba, as well as the includes, are installed properly. Compiled successfully in 2703 ms.
Then try running the program again and it should work for you. make sure you got the latest SRL release. There was a bugfix like 11 days ago that solved an issue that caused something like this error. So just make sure. New error, this is after commenting out smart and using the regular oldschool client. This is right after logging in manually, on the welcome screen. Error occurs in FindColorsTolerance file. Last edited by randy marsh; 05-07-2018 at 05:43 PM. Your include setup is wrong - you need to put the contents of the extracted zips into \Includes\ so it ends up being \Includes\srl\osr.simba, without the extra SRL-1.03 directory in between. Arghhh im so confused sorry I never used simba before just used to use srl way back in the day. Do you have a screenshot of correct folder layout? Last edited by randy marsh; 05-07-2018 at 08:29 PM. The contents may differ slightly, but should by quite similar, like the .gitattr file is irrelevant. Last edited by slacky; 05-07-2018 at 09:12 PM.